Now for something a little bit different……How about this Brilliant blue Subaru Impreza WRX STi?! This is by a talented builder by the name of Anthony Bonz and modelled after a real car owned by Tito over at tito_sti on Instagram. You’ll notice straight away that the track has been widened using a set of Eightyone rocket bunny fenders in metallic black from Tamiya. These house a set of 18″ Work Brombacher wheels from C1 models and finished in a striking metallic copper Humbrol colour. Further enhancements were made to the body styling. Including scratchbuilt side skirt extensions along with a custom diffuser at the rear. Poking out from that diffuser is a real metal muffler from Fujimi. 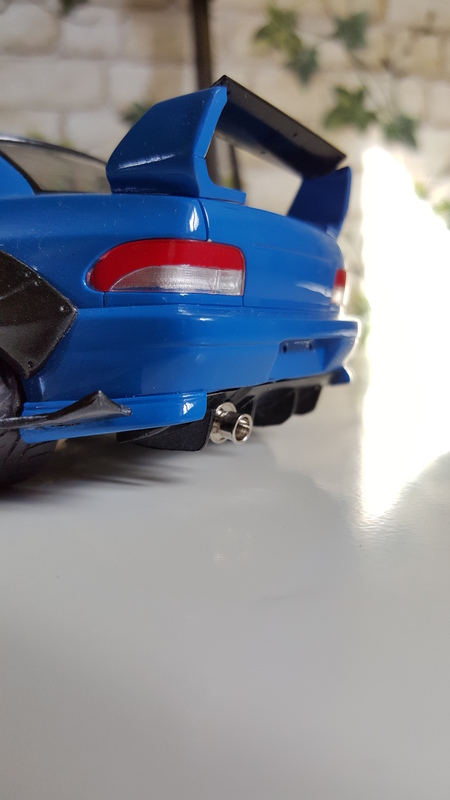 Adding that bit of extra down force, the modified stock wing has been upgraded with a Fujimi wing to give it not only a fresher look, but also keeping the OEM look as well. At the front is a modified Rocket Bunny lip that finishes off the front of the car perfectly. A complete EJ20 engine from Eightyone was used alongside a custom intercooler and piping to prove that isn’t just all show and no go! A fresh and unique take on the familiar Impreza base. All the parts work in harmony to create this stunning machine, thank you Anthony for providing me with this feature, if this hasn’t got your creative juices flowing then I don’t know what will! I almost stopped typing the write up for this on many occasions and jumped back to the bench! Check out Anthony’s Instagram account here for more of his awesome work!